ACC Secretary-General Chen Dehai says he looks forward to closer cooperation and coordination between the Tourism Ministry of Cambodia and ACC, especially in co-organizing the two flagship projects of Tourism Chinese Language Training and Tourism Capacity Building, in a bid to develop the traditional friendship and strengthen mutually beneficial cooperation between the two countries. Secretary of State Hor Monirath said that the development of Cambodia-China strategic partnership has maintained sound momentum and the tourism cooperation between the two countries has enjoyed broad prospect. As the guest country of honor of Xi’an Silk Road International Tourism Expo 2019, Cambodia expected to attract more Chinese tourists through a series of promotional activities in China and is ready to offer more and better quality tourism products to the Chinese tourists. The Xi’an Silk Road International Tourism Expo 201929th-31st, 2019 was held at the Xi’an QuJiang International Conference & Exhibition Center and initiated by the Shaanxi Provincial Tourism Development Commission. 500 international and domestic hosed buyers were selected and invited with proper orientation to XSRITE 2019 to realize extensive cooperation in tourism industry. 5,000 ordinary buyers and over 10,000 trade visitors were also invited to provide more cooperation opportunities for exhibitors. The promotional event of Cambodia Night was also held. 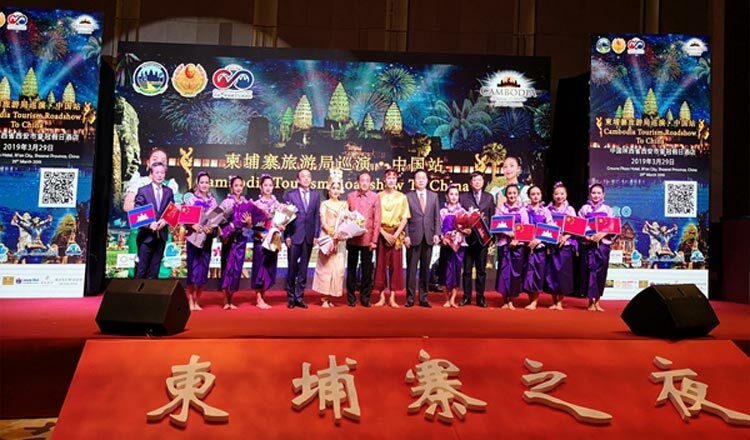 Through marvelous cultural performances, vivid tourism destination presentation, interaction and exchange, the Chinese and foreign guests got rich information on the historical and cultural heritages and latest tourism products of Cambodia. According to the official statistics, the Cambodian visitors to China in 2018 were over 100 thousand, up 65% over 2017; the Chinese visitors to Cambodia in 2018 exceeded 2 million, with a sharp increase of 50% over the previous year.